← Magor Action Group On Rail AGM . . . .
and of course the production, by Mott MacDonald, of the very favourable GRIP 1 and GRIP 2 reports into a station at Magor and Undy which sets the foundation for trying to complete the GRIP 3 study in the next 8 months. A financial report was given which, in summary, said that we have £302 in our current account and £1758 in our savings account. Joanna Coombes was re-appointed as our independent examiner of accounts. The committee and officers were re-elected with an additional member, Murray Ross, being nominated and elected to the committee. Lord Mike German was re-elected as the Group’s honorary president. Three Fields Community Trust – Paul Turner, as MAGOR’s representative on the ‘The Trust‘ gave the background to our involvement and a progress update. Mr Oscar Brown, Manager of The Golden Lion, asked if we would like to have a stall at a commercial event (in aid of St.David’s Hospice), organised by the Lion and being held in the square on 3rd September. This was agreed. Thank you. The Chairman thanked everyone for their support through the year and looked forward to another successful year. Coming months – As we now have the quotation for the GRIP 3 study (Option Selection) we and MCC will be liaising with various Welsh Government ministers and officials on how to progress this next stage. 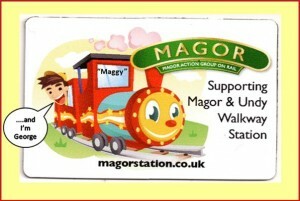 We thank Railfuture and Magor with Undy Community Council for agreeing to help fund this next stage.